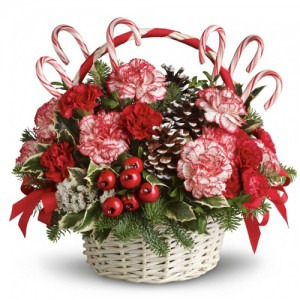 Take a walk through a candy cane forest with this fun, festive basket! This Christmas floral arrangement stars unique peppermint carnations and edible candy canes among fragrant fir, pine cones and berries. It's an easy way to send the Christmas spirit to someone far away! 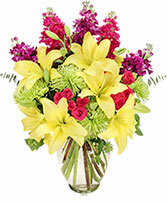 A nice colorful arrangement with shades of purples and pinks. 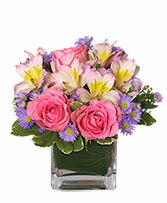 Includes roses and alstromeria and filler flowers. 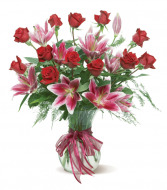 A sweet fragrant mix of pink stargazer lilies and beautiful red roses, arranged in a clear glass vase adorned with a red ribbon. Perfect for Mother's Day, Valentine's Day, birthdays or other occasions.